Well it's the day after Thanksgiving. I am thankful for my family, friends, nature, health, travel, and adventure. I work in the hospitality industry, so unfortunately was not able to spend this holiday with family. I did however, find it quite necessary to make some stuffing! Work has been quite time consuming, so I didn't grocery shop specifically for any items for this recipe. It's straight from the RVegan pantry and produce I had on hand. I've cut back on bread quite a bit this year, due to not being able to easily find quality bread made with unrefined flour, organic wheat, and non GMO ingredients. It's a full time job finding real food sometimes that meets my standards, a strict list of rules about food that I abide by. I digress... I am not intolerant of gluten at all, in fact gluten makes me very happy haha, but I had no bread. 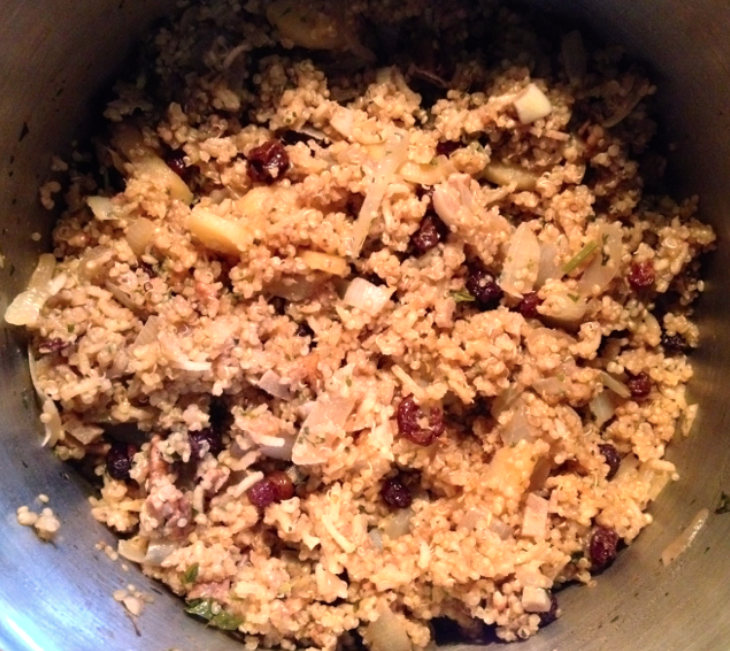 Suddenly comes the inspiration to make a bread-free stuffing. In a large pot, bring water, tamari, and olive oil to a boil. Lower heat and stir in all other ingredients. Cover and simmer on low, 40 minutes. Make sure rice is tender and liquid is absorbed. Serve hot. Ok so, pepperoni rice? How does that work in the vegan world? Basically we are talking about all the seasoning and flavor found in pepperoni, cooked and absorbed by rice instead of meat. The rice is spicy, rich, smokey, and perfectly balanced, stuffed and baked inside a bell pepper. Are you with me? The rice is awesome on it's own, by the way. I make it all the time, and it has been a hit with omnivorous pepperoni lovers, as well as vegetarians. Not to mention it is much healthier than actual pepperoni without all those nitrates and cholesterol. In a small bowl add tomato, water, fennel, garlic, onion, red pepper flakes, cayenne, salt & pepper, ketchup, olive oil, soy sauce, and liquid smoke. stir to combine. Pour mixture into a pot and bring to a boil. Reduce heat to low and stir in rice. Cover and let simmer on low 25 minutes. Remove from heat. Preheat oven to 350ºF. Wrap peppers in foil and bake 15-20 minutes. Remove from oven and spoon in pepperoni rice into each pepper until full. Bake another 20-25 minutes until heated through and pepper is tender. Top with vegan cheese (optional) and bake a few more minutes until cheese is hot and bubbly. To make my own veg mozzarella, I use the cheese from this Somer McCowan recipe (below). It is very easy, very cheesy, very melty, and very delicious! I like it much better than store bought veg cheese. It was 87 degrees yesterday, not bad for November! Once the sun went down, though, drastic temperature change. It immediately became soup weather. 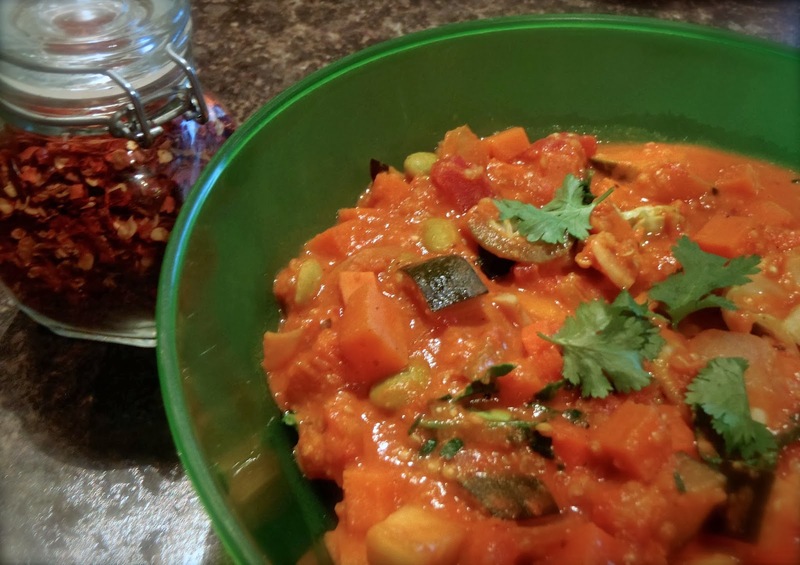 This is a beautifully seasoned, hearty vegetable stew. The veggies are easily interchangeable with what you have and what you like, because it's all about the flavorful nutty tomato soup base that brings it all together. I added quinoa to my version, but that can also be omitted or substituted by serving over rice. In a large pot over medium heat- add oil, onion, sweet potato, and jalepeno. Sauté 5 minutes. Add zucchini, garlic, carrots. Cook another 5 minutes. In a small bowl, mix broth, peanut butter, and spices until smooth. Add tomato and broth mixture to the pot with the vegetables. Lower heat and simmer 20 minutes. Add quinoa and edamame. Cook until quinoa is tender. 20-25 minutes. In the last minute stir in kale and cabbage OR ladle stew over top of raw kale/cabbage mix in the bowl while serving. Garnish with cilantro. Autumn is tourist season in Sedona, and it is in full swing! We've been working like crazy and trying to get outside as much as possible. The weather here is perfect for hiking, climbing, sight-seeing, and RVing! All the while, we've been planning for winter. Our annual RV-free month long trip to the east coast is in the works. Stops may just include New York, New Jersey, Georgia, South Carolina, and Florida. Then back west to check out Tucson, Arizona perhaps for the rest of the winter. Apparently we are sticking to the snowbird lifestyle, as our RV is not really equipped for 4 season living. I feel really lucky to live the way I do, and wouldn't trade places with anyone for anything! A life blessed with health, family, love, joy, adventure, and a spectacular view. Ok, so hopefully all that happy crap didn't make you barf....or lose your appetite. It's time to make Portobello and Sun-dried Tomato Polenta Balls ! Over medium heat, in a non-stick sauté pan, combine everything except the cilantro. Stirring often, cook until polenta thickens to very firm, 20-25 minutes. Remove from heat. Stir in cilantro. Let cool 5-10 minutes. Form into balls. Can be served cold or fry balls in a little olive oil until golden brown and serve hot.